NEWDESIGNERBRIDALCOLL8016PT: Platinum Engagement Ring Set with Heart Diamond and princess cut diamonds & square pink sapphires with a total weight of 2.0 cts for $4975.00. This ring comes with a professional Third Party Appraisal. 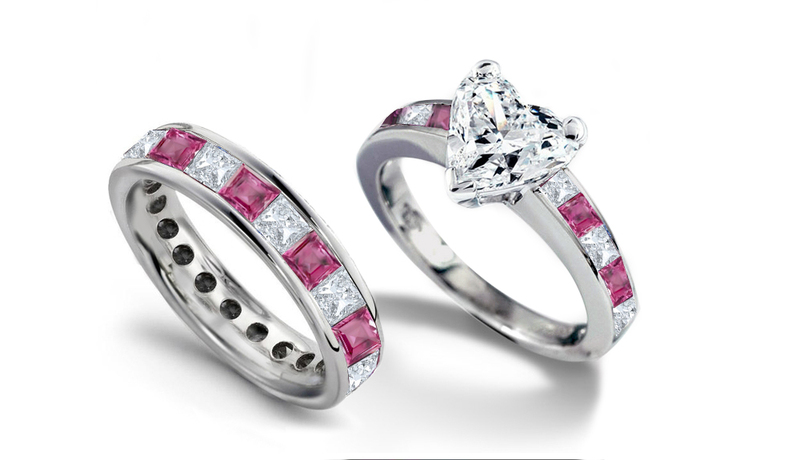 NEWDESIGNERBRIDALCOLL8016PTWB: Platinum Wedding Eternity Ring Set with princess cut diamonds & square pink sapphires with a total weight of 1.75 cts for $1975.00. This ring comes with a professional Third Party Appraisal. NEWDESIGNERBRIDALCOLL8016GO: 14K White or Yellow Gold Engagement Ring Set with Heart Diamond and princess cut diamonds & square pink sapphires with a total weight of 2.0 cts for $4775.00. This ring comes with a professional Third Party Appraisal. NEWDESIGNERBRIDALCOLLGO8016WB: 14K White or Yellow Gold Ring Wedding Eternity Ring Set with princess cut diamonds & square pink sapphires with a total weight of 1.75 cts for $1775.00. This ring comes with a professional Third Party Appraisal. NEWDESIGNERBRIDALCOLL8017PT: Platinum Engagement Ring Set with Heart Diamond and princess cut diamonds & square pink sapphires with a total weight of 2.50 cts for $6275.00. This ring comes with a professional Third Party Appraisal. NEWDESIGNERBRIDALCOLL8017PTWB: Platinum Ring Wedding Eternity Ring Set with princess cut diamonds & square pink sapphires with a total weight of 2.25 cts for $2275.00. This ring comes with a professional Third Party Appraisal. NEWDESIGNERBRIDALCOLL8017GO: 14K White or Yellow Gold Engagement Ring Set with Heart Diamond and princess cut diamonds & square pink sapphires with a total weight of 2.50 cts for $6075.00. This ring comes with a professional Third Party Appraisal. NEWDESIGNERBRIDALCOLL8017GOWB: 14K White or Yellow Gold Ring Wedding Eternity Ring Set with princess cut diamonds & square pink sapphires with a total weight of 2.25 cts for $2075.00. This ring comes with a professional Third Party Appraisal.